The pressure exerted by lasers has been shown to be effective in moving small pieces of space debris into safer orbits, but the attempt took 48 hours, and the mass of the piece of debris was only a few pounds. 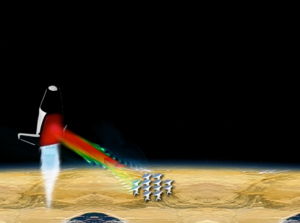 However, in this application, it is proposed that lasers are substituted for chemical rocket engines, with the atmosphere supplying the reaction mass. 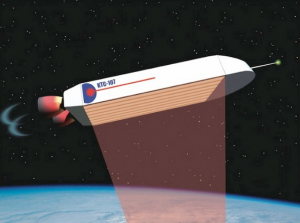 The idea of laser propulsion was first proposed by Arthur Kantrowitz in 1972, but recent space treaties between space-faring nations have all but outlawed the use of powerful lasers in space, perhaps understandably so, since lasers are viable space weapons. The problems with lasers as a method of propelling space craft involve the prodigious amounts of energy required to make them work on the one hand, and the need to protect payloads against radiation damage caused by powerful lasers. To date, no satisfactory trade-offs between power requirements, the required intensity of the lasers, and the political repercussions of operating powerful lasers have been arrived at.